PAMPANGA, October 8, 2018 — Special Assistant to the President (SAP) Christopher Lawrence “Bong” Go today fulfilled his promise to establish a Malasakit Center to give Kapampangans easier access to financial assistance, in line with President Rodrigo Roa Duterte’s commitment to provide quality health services to all Filipinos. 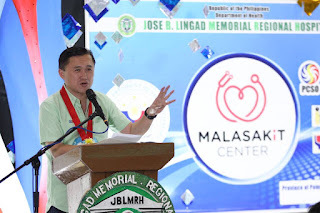 Together with the officials from the different government agencies and the local government officials of Pampanga, Go led the formal opening of the Malasakit Center at the Jose B. Lingad Memorial Regional Hospital (JBLMRH) in San Fernando City, Pampanga. Following the program, Go proceeded to the Emergency Ward of JBLMRH where he visited some patients and extended assistance to them. Go has been instrumental in putting up Malasakit Centers throughout the country. 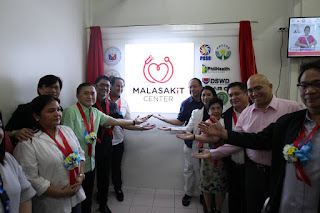 Currently, there are also Malasakit Centers in the cities of Cebu, Tacloban, Iloilo, Bacolod, Puerto Princesa, Maasin, Dumaguete, Davao, and in Manila (Philippine General Hospital). By the end of the month, the government eyes to put up at least five more Malasakit Centers in various cities like Tagbilaran, Zamboanga, Cagayan De Oro, Legazpi, and Butuan, to name a few, according to Go. In his visit to Pampanga, Go said the Duterte administration will also provide more projects to further develop and address problems in Central Luzon. “Maraming proyekto ang nakalaan para sa Pampanga. Tomorrow po may ground breaking ceremony para sa Integrated Disaster Risk Reduction and Climate Change Adaptation Measures ang DPWH sa Minalin, Pampanga,” Go said in an ambush interview. 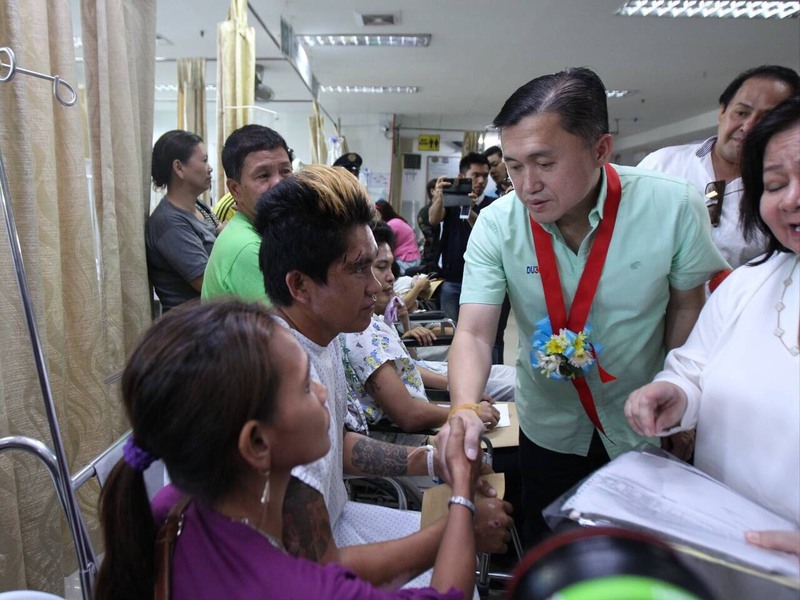 During an earlier visit of Go in Pampanga last August 28, he promised that he will talk to the Department of Public Works and Highways (DPWH) to address the problem of flooding in the area. The PhP6.15-B project is a flood-control facility of DPWH that targets to reduce the damage brought by perennial flooding in southern Pampanga. It is expected to finish in March 2022. Go enumerated several other infrastructure projects that are lined up for the Kapampangans under the Duterte administration. “Ang new Clark International Airport ay matatapos sa 2020. Ongoing po ito para dumami pa ang kapasidad para sa airport na ito (para maka-accommodate) ng additional 8 million na passengers. Naumpisahan na rin itong New Clark City Food Processing Terminal and International Food Market natin. 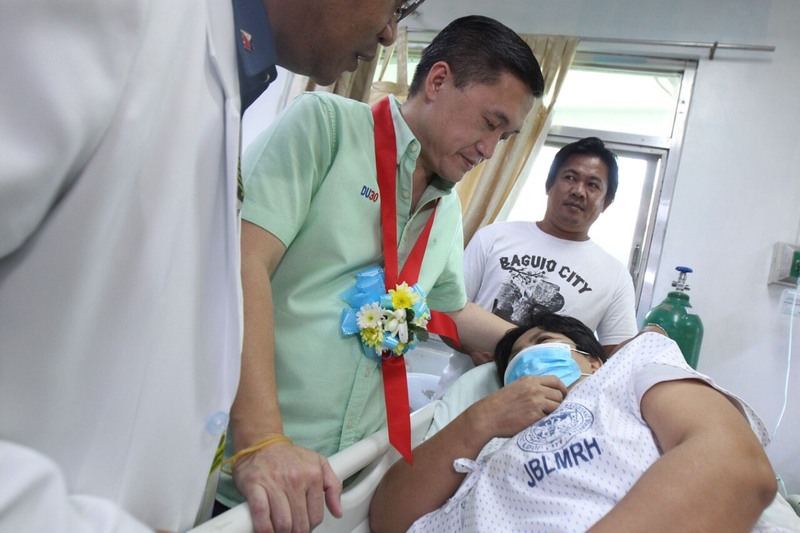 At next ‘yung Subic-Clark railway, under the ‘Build, Build, Build’ program,” he added. Meanwhile, when asked about the upcoming 2019 senatorial elections, Go said he is still not considering the possibility of running. “Unang-una kailangan ko pa mag-dasal. Pangalawa, syempre ang desisyon po ng ating Pangulo. Papalapit ng papalapit ang araw na iyan kailangan ko ng mag-desisyon,” Go said. BUTUAN CITY, Oct. 8 — About eight security guards from AB Security Services have recently received their work entitlement fee held at the Department of Labor and Employment (DOLE) Caraga Regional Office, this city. Each of the guard received a cheque that totaled to Php295,000.00. The affected workers were from Surigao del Norte, namely Audie T. Baslot, Mar E. Baja, Jonathan P. Nepomuceno, Richard C. Estrera, Roldan Eupnilde, Ben Alexis T. Rosalin, Marjun P. Aguilar, and Vermie C. Parao. According to them, they were underpaid of their minimum wage, unpaid of their night shift differential, holiday pay and service incentive leave. The checks were released after the management of AB Security Services represented by the Security Director Yulie M. Yap showed willingness to comply with the order issued by DOLE Caraga Regional Director Chona Mantilla from the complaint inspection of Labor Inspector Romelyn Bactol on March 7. The checks were released in the presence of the DOLE Caraga Assistant Regional Director Naomi Lyn Abellana, the Officer In-Charge of the Technical Support Services Division Annie Tangpos, and the DOLE Caraga Cashier Ana Delos Reyes. When ARD Abellana asked the recipients what they are going to do with the money, some responded that they will use the money for the school fees of their children, some for house repairs while others will use it for daily expenses. In 2017, there were at least 3,433 workers in Caraga who benefitted from work entitlement with a total amount of Php10.8-M and as of August 2018, 442 workers received their claims totaling Php11.9-M. Under the general labor standards, the workers are bound to receive wages and other benefits as stipulated under existing laws, rules and regulations. 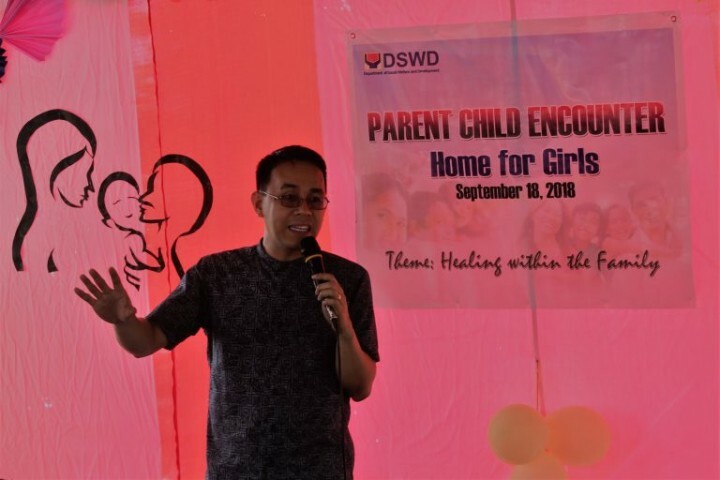 BUTUAN CITY, Oct. 8 - Themed “Healing Within the Family,” the recently held parent-child encounter of the Department of Social Welfare and Development (DSWD)-Caraga’s Home for Girls (HFG) focused on the restoration of family relationships as part of furthering the department’s aim in bringing “vulnerable” children close to their homes. Parents and guardians of HFG residents coming from different provinces of Caraga attended the one-day encounter, which is anchored on the celebration of the National Family Week. “Kasagaran sa mga ginikanan makalimut na sa ilang relasyon sa ilang mga anak tungod kay mas nafocus sila sa pagpaningkamot nga mahatag ang ilang mga kinahanglanon (Most of the parents have forgotten the importance of their relationship with their children as they are very much focused on providing their needs),” Marababol said. Marababol said that part of the many problems of young people today is their relationship with their parents because a lot of them seem to feel distant from their families as they do not feel happy inside their homes. “Ang balay nga ang haligi gianay, lisod dyud mulampusay. Kung ang gihatag sa ilaw ng tahanan kangitngit, aha man padulong ang mga anak (A house whose pillars are weak will hardly survive.. where will a burnt out light of a home take the children)?” added Marababol. He also pointed out that parents should help their children in learning to love others. “Maningkamot kita nga ang atong pamilya naa dyud kabag-ohan (work on bringing change to your family),” Marababol reminded the parents. After Marababol’s talk, parents and children were given time to write each other letters which they personally read on a private dialogue. “Nalipay ko nga makauban akong pamilya karung adlawa ug maistoryahan ang mga gusto namo isulti sa ila (I am happy to be spending time with my family today and tell each other what we wanted to),” said one of the residents. Also featured in the encounter are testimonies of successful discharged clients, tribute to parents and participants’ sharing of learnings. The parent-child encounter is an annual activity of the HFG done every September. This year, the activity has commenced right after the groundbreaking of the two-story dormitory for the center, which is set to be completed in January next year. BUTUAN CITY, Oct. 8 - The Philippine Statistics Authority (PSA) - Regional Statistical Services Office Caraga, in coordination with the Regional Statistics Committee (RSC), invites all agencies of the government, local government units, academic institutions, state universities and colleges, and the private sector to participate in the month-long 29th National Statistics Month (NSM) celebration. This year’s 29th NSM with the theme “Exploring Philippine Wonders in Numbers: Statistics Towards Sustainable Tourism Development” reflects the relevance of statistics in achieving a sustainable and progressive tourism growth for the country and emphasizes the need for statistics to identify potential tourism havens and areas which require intervention. All participating organizations, universities/colleges and units of the government are also requested to display the 29th NSM streamer/tarpaulin in their building facade throughout the month of October. Recently, the PSA led the kick-off activity on October 2, 2018 through an opening program held at the Robinson’s Place Butuan. The NSM is annually observed nationwide pursuant to Presidential Proclamation No. 647, declaring the month of October of every year as the National Statistics Month. BUTUAN CITY, Oct. 8 - Building officials, fire marshalls and local government unit departments involved in the issuance of construction permits of the six cities of Caraga Region were recently given a training on Streamlining Building Permits and Certificates of Occupancy held at the Butuan Grand Palace Hotel, this city. 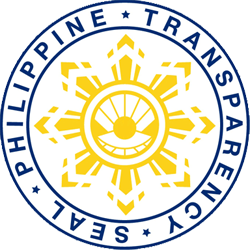 The said event is in response to the President’s call to streamline all government transactions and contribute to improve the country’s ranking in global competitiveness survey. 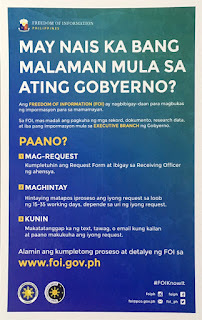 The DILG through the Bureau of Local Government Development (BLGD), in collaboration with Department of Public Works and Highways (DPWH) Department of Information and Communications Technology (DICT) and Department of Trade and Industry (DTI), issued Joint Memorandum Circular (JMC) No. 2018-01: Guidelines in Streamlining the Processes for the Issuance of Building Permits and Certificates of Occupancy, dated January 04, 2018. This year’s target in Caraga for the implementation of the JMC are the cities of Bayugan, Bislig, Butuan, Cabadbaran, Surigao and Tandag and will be expanded to include all municipalities in subsequent years. Among the reforms instituted in the JMC is the use of a unified form, the establishment of a One-Stop Shop for Construction Permits, and setting of the standard number of steps at 4 steps, and standard processing time at five days. It is to be noted that the processing time assumes that all requisite documents are complete. The JMC covers simple applications for building permits and certificates of occupancy. It refers to applications for structures not exceeding 1,500 square meters: single dwelling residential buildings of not more than 2 floors or storeys; commercial buildings of not more than 2 floors/storeys; renovation within a mall with issued building permit; and warehouses storing non-hazardous substance. The One-Stop shop concept implores the One-Government and Accessibility of Government Services principles. For this, the co-location of LGU departments involved in the application for these permits have been recommended. It is envisioned that the applicants will only submit all required documents to one receiving officer and every process pertinent to the application of the permit are incorporated, such as the verification by the Assessor over the tax declaration, the Treasurer over tax clearances, and the zoning officer over the locational clearance; the evaluation by Office of Building Official as to technical requirements such as line and grade, architectural, structural, plumbing/sanitary, electrical, etc., joint inspection and verification by building inspectors and BFP; fire safety evaluation/inspection by the BFP, and a one-time assessment including barangay fees, then payment of fees and release of all documents. “This training is very timely because just this May, the president signed into law the Ease of Doing Business (EODB) Law or RA 11032 which includes the streamlining of all LGU permits, including construction permits. We are here to help capacitate the LGUs to know the standards and the guidelines in achieving these standards so that we are compliant to the law which imposes severe sanctions to those culpable of violations,” said DILG Caraga Regional Director Lilibeth A. Famacion.